I've long considered Mitzvah Notes to be one of Chabad's most influential and innovative integrations (Did Chabad even start this? Did I just make that up? Someone please weigh in on origin!). It's one of those things that has seemingly been around for so long, we don't stop to think about how this was first initiated. As a preschool teacher, I'd often marvel at the gift of the Mitzvah Note, as it enhanced the way I understood and interacted with the children each and every morning. These scrawled and scribbled little notes let me glean a glimpse into the child's home structure, their personal challenges and victories, the things they loved and those they didn't, and brought a little bit of everyone's home life right into the classroom. 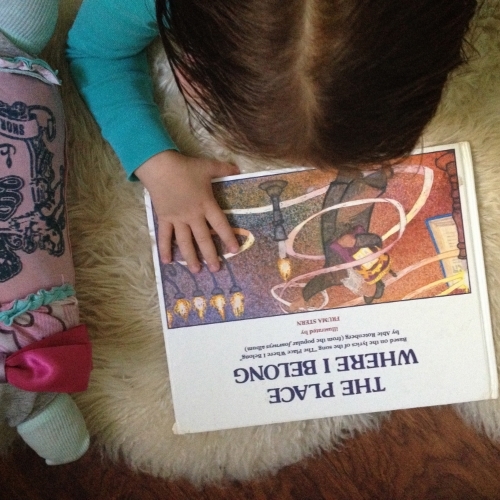 The daily ritual of reading the Mitzvah Note aloud connected the parent to the teacher to child, and in that moment something magical happened: a spotlight shone on each little friend - even if just for a moment - and they were celebrated. They were celebrated for being human; for a moment of being kind or thoughtful or patient or generous, and many times for struggling and for succeeding. It's no wonder that this concept took off so well and became one of the most primary staples in the functions of a jewish preschool classroom. Whoever created the Mitzvah Note, must've been a straight-up genius. Years later, when I was blessed with children of my own, I found myself surprised at how difficult it sometimes was (especially in the early morning hustle) to come up with a mitzvah my child had done in the 24 hours since the last one! I mean, she was a 3-year-old - chockfull of tantrums, and pint-size defiance, and I was a breastfeeding mom to her brand new baby sister - sleep deprived, distracted, and juggling so many responsibilities; it wasn't always easy to think of something good she had done. And it was then, in that bleary-eyed, early-morning, postpartum-ly distorted view of life, that I happened upon the real genius of the Mitzvah Note: noticing. The Mitzvah Note trains us, as parents, to notice! It calls for us to take note in all the little ways our children do good. And, as it turns out, they do plenty of good. All.day.long. It's so easy to overlook it - or to not even see it to begin with! - but a few weeks into a jewish preschool year, the parents become experts at extracting excerpts of good deeds gone down daily. And this becomes an integral parenting skill that lends to gratification of day-to-day life with little ones, and celebration of their qualities and accomplishments. This new way of "noticing" somehow subconsciously extends to other areas of parenting too, and turns into a gift of a skill we hadn't even noticed we were honing. Like I said, straight-up genius! A note like that not only encourages the child to keep up the very hard but very good work, it also let's the teacher know what is going on and what they can help with. I know I would have appreciated something like this as a teacher. It's not extra work - it's extra insight. And that's always helpful in the classroom. But Mitzvah Notes get even more dope than that! (Likely, lots of you older, more experienced, and well-seasoned mothers out there have probably known this for years! But I've only just discovered it.) And here's the trick part: these few small sentences read to my child every morning by her beloved teacher, encouraged her and made her believe even more in her own internal power to do good! It's known that we grow to believe what we are told about ourselves, and here we have the opportunity to tell them something good every morning. It's a common chassidic belief that what you call a child they become. And let me tell you, it works!! For a year now, I've been writing mitzvah notes that focus on something my child is having a hard time with, and emphasizing how I know they try so hard and will surely succeed. The results of this have blown my mind, and that's why I'm writing all of this to begin with - to share the discovery of decoding the daily dictation. When Hudi was having a hard time with food and going through a super picky stage, her Mitzvah Notes looked much like the one in the photo above - focusing on what good care she takes of her body and how much she loves to feed it fuel. Three days later, she was showing off her broccoli eating skills and bragging about her muscles! When Freida was having a hard time sharing and going through a stage of big-sister angst, her Mitzvah Notes would focus on what a caring. loving, and generous big sister she is. Within a few days she was teaching Hudi how to color in the lines, making a friendship bracelet for her, and being an all-around giving big sister. I even tried using Mitzvah Notes as a (single) parenting survival tactic...that worked too! So before a cross-country trip alone with the kids, I'd write about how proud I am that I know they'll behave so well on the plane because they are so good at making a Kiddush Hashem. And when I was having a really hard time with how crummy and kvetchy our mornings were lately, I'd focus their Mitzvah Notes on how wonderful it is when they wake up with a smile and brighten everyone's day. Or when they were going through a stage of waking up way too early in the morning, I'd write Mitzvah Notes that focused on Kibud Av V'eim and what a giant mitzvah it is to respect their mother. Etc. Etc. In short (just kidding), Mitzvah Notes have quite literally enhanced my parenting life, and this "trick" continues to quite figuratively blow my mind. Fellow mothers of the internet, this WORKS. And while it sounds like manipulating the system, you can rest assured that it IS manipulating the system, and it is awesome! Mitzvah Notes are one of those things that when I stop to think about in concept, I am overwhelmed by how lucky we are to be a nation that cultivates encouragement, praise, and celebration. What a gift. I'm so colossally terrible at math - I'm embarrassed by this on almost a daily basis. And while I've come to terms with the fact that I just don't have the head for numbers (and I mean any numbers! ), I constantly find myself drawn toward things that would save my girls from a similar fate. That said, I wanted to share two fabulous finance-themed gifts to go with all the gelt. it's like the most beloved exhibit at the childrens museum - right there on your couch! i think the store app itself is a fabulous way for kids to explore numbers via prices, addition, and change. the fact that it goes live? that's just fun on steroids. winning. Wishing you and your littles the happiest Chanukah! Enjoy these goodies, and may the gelt be all year 'round! Michal Baratz Koren is an Israeli artist (photographer) bringing the biblical #girlboss out from behind the mechitza and to the gallery walls. I've long been fascinated by jewish heroines and while pregnant with Hudi (once I found out I was carrying my second daughter) I found myself pouring over the ancient text to find unique women in holy history and read about as many female freedom fighters I could find. And let me tell you, there are many! It's honestly quite shocking that people view Judaism as a religion where women take the backseat - the women throughout the Torah paint a completely different picture. I really never liked feminists much; I long-loved the idea of moms staying out of the workforce to nurture their families and build their homes. I used to fantasize about waking up in the early '60s (though, not as Betty Draper!) when a woman's primary roll was clear enough, yet she had options. But ever since my marriage fell apart, and I've had to deal with the cold harsh reality of being the underdog just for being the woman... Let's just say there was enough crap to turn me toward seeing the value and necessity for femininity. These images by Baratz Koren have left me spellbound and in wonder. Read the fascinating details behind this art here. Enjoy! I watched the documentary Happy when it came out in 2012 and loved it. I watched it again recently, after experiences grief and pain and heartbreak, and I still loved it. I find it fascinating that happiness is a science that can be studied and measured! That people will forever be prying and dissecting it - to deduce where it come from and what it's made of. That there are real factors that have been proven to make people less happy (long commutes to work!) and more happy (nature!). And that there are places and nationalities that are much more happy or much less happy than others around the world. I always thought of happiness as a blessing. I thought of it as something you are born with, a nature, of sorts. Much like a talent or a demeanor. I thought of it as the luckiest gift one could get - because it made everything in the world better. As a (legitimate?) grown up I still believe much of this to be true; I know that motherhood - by watching two very different girls grow from birth to childhood, and seeing their innate natures from when they were only a few weeks old. In general though, I do strongly believe that "the nature of man is to be happy - look at children and you will see". I'm not sure where things go awry, but it seems to be that as we grow we stop pursuing happiness the same way we did when we were young. And as it turns out - the most proven formula for happiness? Random acts of goodness and kindness. In any case! Just wanted to share the documentary here (and it's on Netflix so you can enjoy it asap). P.S. For those of you with a good JLI in your district, the new course "How Happiness Thinks" looks like a winner. And for those of you in the greater Los Angeles are, this looks interesting too. In 6th grade I had a wonderful teacher, and she taught us what she said was her favorite song, "The Place Where I Belong" by Abie Rotenberg. I have been letting Freida listen to that song before bed for a while now (since all the curious Torah talk cropped up), and when I went to spend the holidays with my family in Skokie, I scoured my childhood home until I found this old treasure of a story book. The Place Where I Belong, based on the lyrics by Abie Rotenberg, illustrated by Fruma Stern, has kept my children enraptured. We play the song (thank you Spotify), and the girls follow along with the book. Having a visual of a Sofer writing a Torah, a community celebrating it, and honoring it, and passing it through generations - has seemed to sufficiently satisfy a lot of her curiosity about the whole thing. And seeing it hidden away, preserved in a museum, and rescued and restored to a community once again has done much to impart the fact that the Torah is not just an object, but a living way of life. And I'm so grateful that this book and this song were able to help me out in parenting/educating department, I thought I'd pass along the goodness. Can't seem to find the book available anywhere online, and I wonder if perhaps it is out of print? If anyone knows where to find this gem, please let me know so I can update this post with an active link! Thanks!! Here's to having the right answers...!